Zahra is a sweet Oriental fragrance that gradually becomes a little spicy. It starts with light floral notes, but has a body of rose, jasmine, marigold, mimosa (sleeping grass), saffron, berries and ends with Dehn el ood, sandal, musk and vanilla. 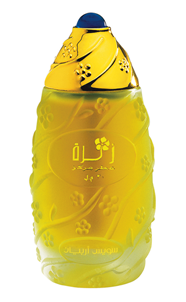 Another delightful perfume oil by Swiss Arabian, one of the biggest Arabian perfume maker and supplier in the Middle East.This perfume comes in the bottle pictured and comes sealed in an outer box, perfect as a gift or for personal use.